Canadian National Railway Station, Vegreville (DSC_3053 Historic Resources Management Branch). When the Canadian Northern Railway strung its line through east central Alberta during 1904-05, a number of sidings were put up. At a few locations, stations were erected and townsites subdivided. One of the townsites was near the tiny community of Vegreville, named after the Oblate priest, Father Valentin Vegreville, in 1895 when a post office was opened. The name was probably suggested by Father Morin, who was trying to establish a Roman Catholic Francophone colony in the area. A few French settlers did come in, and, by the turn of the 20th century, a few English settlers were around as well. A number of Ukrainians were also beginning to arrive, some spilling over from Ukrainian settlements further to the east. In time, Vegreville became known as, primarily, a Ukrainian district, exhibiting many trappings of Ukrainian culture. With the coming of the railway, many more settlers arrived, and the earlier community was soon replaced by the railway center. With the railway, farmers in the district could at last ship their produce directly to markets in the East. As the hinterland was so large, a building boom occurred in Vegreville. In August 1906, the community was incorporated, first as a village and then as a town, with over 400 people. The district experienced much prosperity during World War I, but, like the rest of rural Alberta, it suffered from reduced grain prices following the War. The Canadian Northern was also suffering, and, in 1919, it was taken over by the Dominion government and made part of the Canadian National system of railways. … the present CNR station is an eyesore and a blemish on the fair face of the town, and the facilities provided the travelling public at this station were ridiculously inadequate for the size of the town the station intended to serve. … The CN, as our pioneer railway, has always been generous to Vegreville, not unduly so, but sufficiently for our present needs. 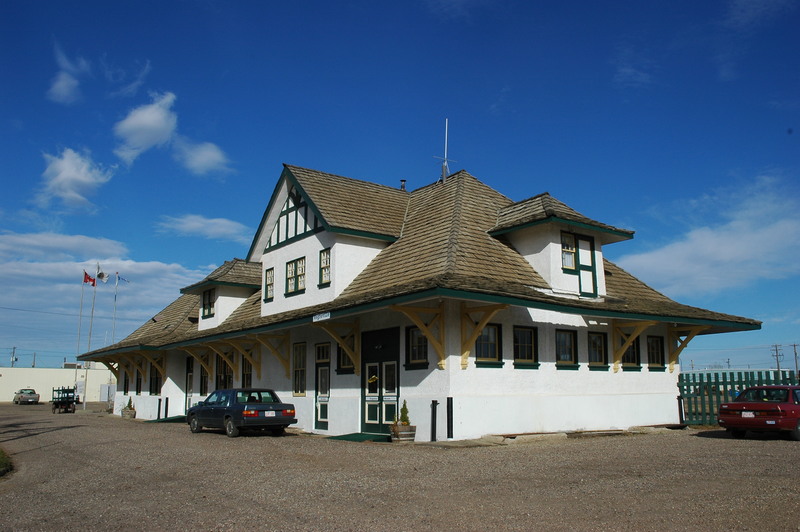 The station’s historical significance lies in its service as a station for the entire Vegreville district from 1930 to 1975. As such, it was the nerve centre for the export of agricultural produce, and the import of finished products. It also provided a passenger service for people travelling east or west, and contained the district telegraph office. This 1930 CN Station in Vegreville served the community as a station until 1975, at which time it was sold to the town and converted into other uses, including a seniors drop-in centre. Currently, the station houses a restaurant and provides meeting space upon request. Visit the Alberta Register of Historic Places to learn more about the heritage value of the Canadian National Railway Station in Vegreville. In order for a site to be designated a Provincial Historic Resource, it must possess province-wide significance for either its history or architecture. To properly assess the historic importance of a resource, a historian crafts a context document that situates a resource within its time and place and compares it to similar resources in other parts of the province. This allows staff to determine the importance of a resource to a particular theme, time, and place. Above, is some of the historical information used in the evaluation of the Canadian National Railway Station.